As Bangladesh has observed the language martyrs day on February 21st, do you know that the world observes International Mother Language Day on the same day as well? A lot of us may not know that UNESCO has been observing mother language day for last six years. Bangladesh has played a pioneering role in observing the language day to honor our language martyrs 34 years ago. 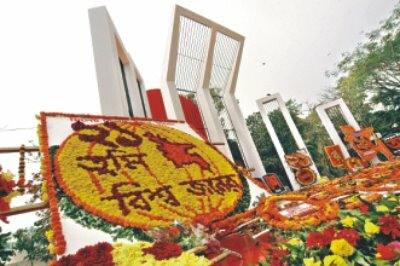 Every year Bangladesh uniquely observes language movement that energizes our cultural revival and takes us back to our proud history for Bangla language. As UNESCO’s Press Release says, “International Mother Language Day is celebrated every year on 21 February to promote the recognition and practice of the mother languages of the world, and especially those of minorities. It was proclaimed in 1999 during the 30th session of UNESCO General Conference”. UNESCO has organized a conference on linguistic diversity to observe this glorious day. Do you know that according to UNESCO, “half of the world's 6000 languages are in danger of disappearing in just a few generations”? That’s why we need to protect and promote linguistic diversities as UNESCO urges member states to promote 12 point language policy for its member countries. We need to promote language, its wonderful diversity as David Crystal a scholar on linguistic said, "Every time we lose a language, we lose one vision of the world." What are you going to do to enrich your mother language?